I was excited to cycle (yes I’m following my own rules and feeling smug) to the Canton Arms in Stockwell/Kennington for Sunday lunch with a very glamorous Juicy Jigsaw. I was excited because not only was I starving after rather too much vino the night before, I was dying for some nice meaty pub grub, and the team behind the Canton Arms are related to the Eagle, Anchor & Hope on the Cut and 32 Great Queen Street, the latter two real favourites of mine and home to some of the best British cooking I’ve had. We were invited to eat at the bar which was fine, only I’d have preferred to eat at one of the empty tables, but they keep the outside tables and front of the pub for beer drinkers, which I’m sure will appeal to traditional pub-goers. 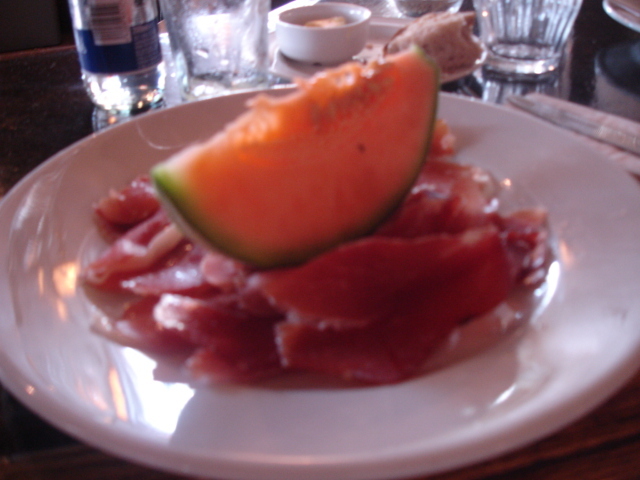 I seem to be on a terrible-ordering spree, but to be fair my starter of choice (beetroot, horseradish and cod’s roe) was sold out by 2.30pm so I ordered the Spanish ham and melon starter, possibly because I was thirsty and I thought the melon would refresh me. 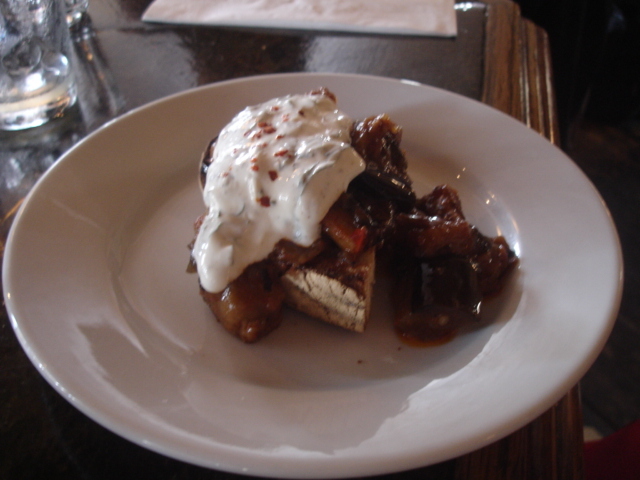 It was nice but Juicy J totally outdid me with a delicious aubergine starter. 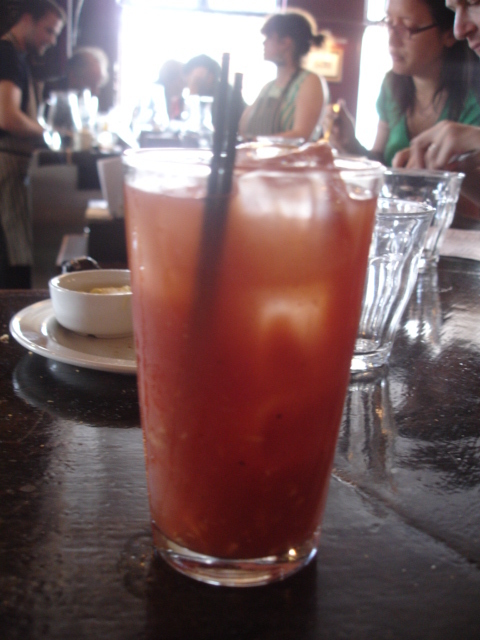 We then, for obvious reasons, tucked into a very alcoholic bloody mary made with lots of fresh stuff and nicely spicy. Finally, Juicy J had the mackerel risotto which tasted just wonderful (ordering envy) and I had the roast lamb with a sort of dauphinoise potato celeriac mix. 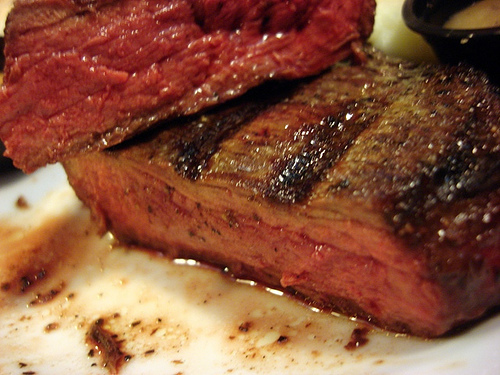 It was good, and the meat was lovely and tender, but I could have done with some veggies (my fault for not asking maybe) and it was a little plain. I would have loved there to have been some interesting game on the menu, or even a nice shepherd’s pie or similar, but gastropub-wise it was still a great choice. But then I spotted it – on the blackboard chalked up in crayon, the stuff of my Great Queen Street dreams – the meat sharing plates. That day they had lamb – big, fresh and organic I’ll bet. 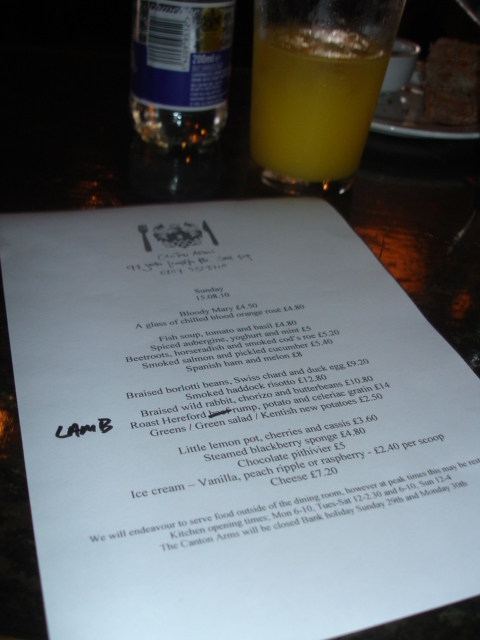 You could order lamb shanks between four I think, and lamb shoulder between five “ish”. There were a few groups in there and this would be my best bet for Sunday lunch – simple, well-cooked, wholesome and hearty. So while I thought the service was great, the food tasty, I think the best thing to do is to head there in a big group for Sunday lunch and take advantage of that week’s group offering, or to try the infamous foie gras toastie bar snack. 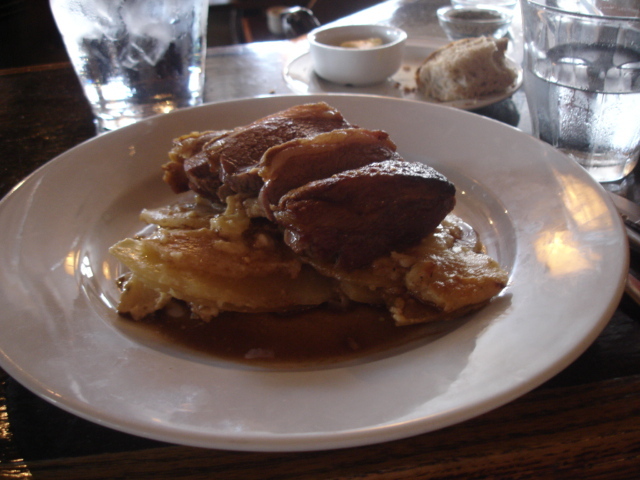 I’d also have loved to try the cassoulet for two, had it been on the menu. At the end we paid £30 each for starter and main, bloody mary, pre-lunch hangover-quashing orange and lemonade and coffees. I’ll certainly be back, en groupe, with a whole afternoon and an empty belly to appreciate that week’s specials.